Last week, Goose Island Migration Week landed in Minneapolis. Packed with plenty of beer-filled fun, here’s a look at the happenings. Migration Week is a time the Goose crew take things on the road and bring beer events to locations around the world. Not only about beer, they highlight food, music, and other artistry that pairs perfectly with a pint. Chef Claudia Sandoval was with winner of MasterChef season 6 on FOX. 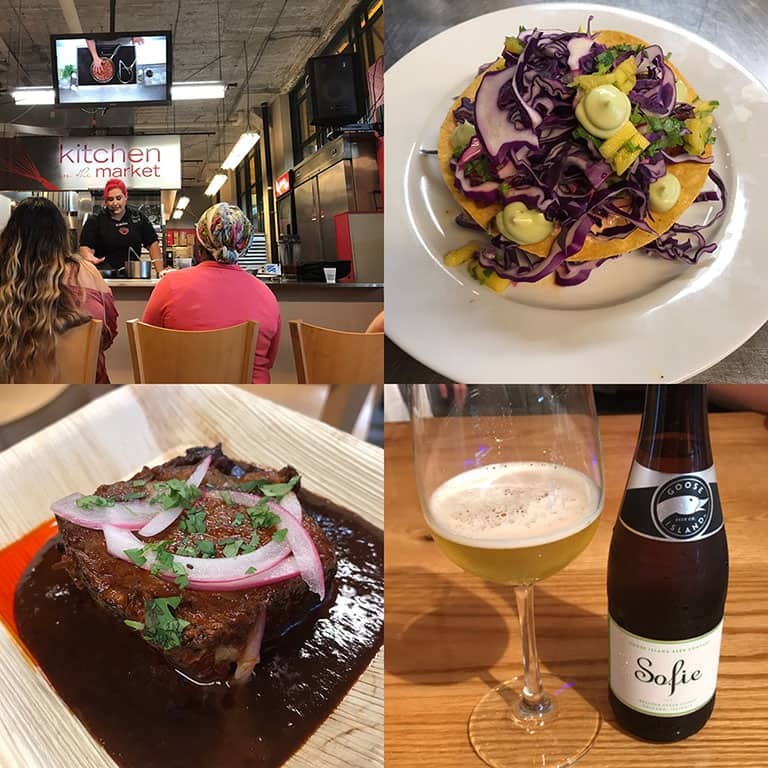 She brought her modern take on coastal Mexican food to Minneapolis in a cooking demonstration and tasting, which was delicious. Held at Kitchen In The Market, Claudia prepared some killer dishes and did a demo to show us how to make pork in adobo tostadas with ease. She followed that up with an amazing beef short rib, and everything paired perfectly with Goose Island brews, including Sofie, Halia, and 312. Be sure to check out Claudia’s best-selling cookbook, Claudia’s Cocina: A Taste Of Mexico from the Winter of MasterChef Season 6 on FOX. Goose Island loves coffee almost as much as beer and this event helped drinkers better understand both. At Blackeye Roasting Co. they explained the process of roasting beans and creating the flavors we love in a good cup. Brewer Rob Anderson then shared to how they go about blending their coffee brews. With Bourbon County Brand Stout 2016 in hand (and 2014 BCBS Coffee too), attendees got to try blending their own coffee-infused imperial stout. On Thursday night the Goose Island crew brought together MasterChef Claidia again, along with local Chef James Leader-Botnan from Golden Nugget Tavern for a delicious 5-course beer dinner. The dinner was unique, in that each chef presenting their own take on each dish. It was interesting to see each chef bring their own inspiration to each item. Rare brews like Madame Rose and BCBS Barleywine 2013 made appearances and delighted those in attendance. During their time in the Twin Cities, the Goose Island team paid a visit to a number of local breweries. Lift Bridge Brewing in Stillwater, Excelsior Brewing in Excelsior, and the new Barrel Theory Beer Company in St. Paul all showed a shared love of brewing with the Chicago brewers. Splinter at Barrel Theory recently told me about a barrel they got from Goose. Look for that fun in the future. The Goose Bus spent Saturday at the Basilica Block Party, pouring pints for thirsty folks enjoying the music and festivities. Migration Week wrapped up with brunch at The Commons in downtown Minneapolis. To serve up brunch in this 4.2 acre public green space, Goose brought in Bang Bang Pie Shop from Chicago to fill plates full of brunch-fare. The Sofie-mosas flowed. If you haven’t had a Sofie mimosa you’ve gotta make yourself (and your guests) some. 1 part Sofie to 1 part fresh-squeezed orange juice (though I like it 3/4 Sofie to 1/4 OJ). It’s a killer way to start any day. It was great to see the Goose Island crew and enjoy all the happenings throughout the week. 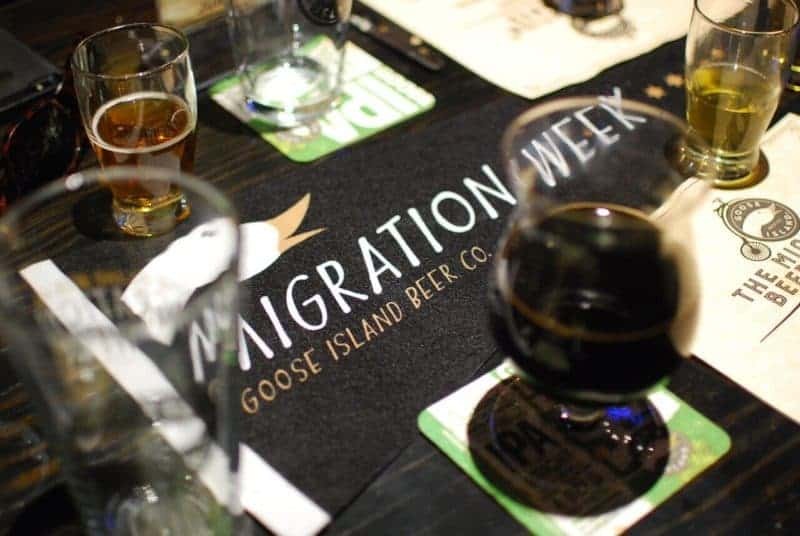 Be sure to check when Migration Week will be headed your way, here on the Goose Island website. Check out all the #MigrationWeek photos and fun on social media. Be sure to follow Goose Island on Twitter, Instagram, and Facebook to keep up with where they’re migrating to next. There’s sure to be lots of beer-filled-fun.